It was the right time to let all my niggling injuries heal and get some down time from running to charge the batteries in view of the next season. 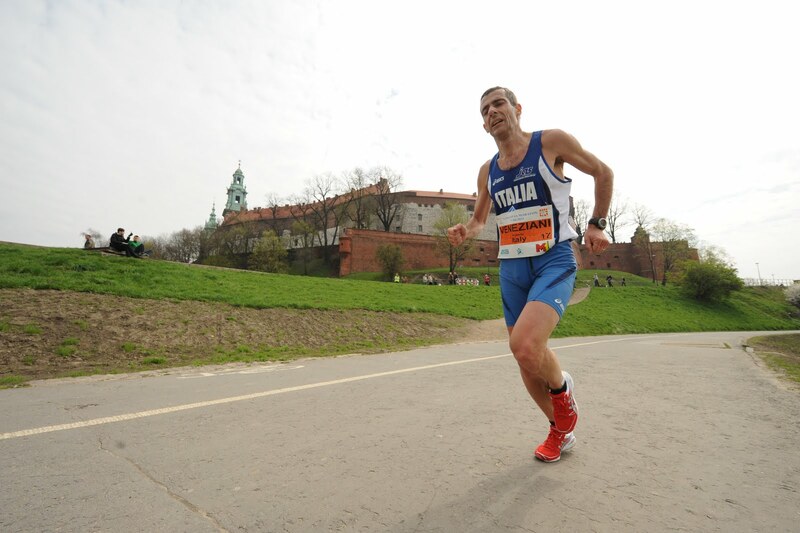 1) Cracovia Marathon: is itself a very nice race, well organized and very much runner friendly. With 3000 at the start, it is still something where you can focus on the pleasure of the race without too many cumbersome logistic problems (like waiting for 3 hours in freezing cold like in NY..). Plenty of water points, with also energy drinks and food, etc... Even a post-race massage was available. For me it was even easier thanks to the kindness of the organizer who granted me a Elite bib. Entry fee is a reasonable 30 Euro and for additional 12 Euro I could get a digital version of all the 59 pictures taken by the race photographs (!!). 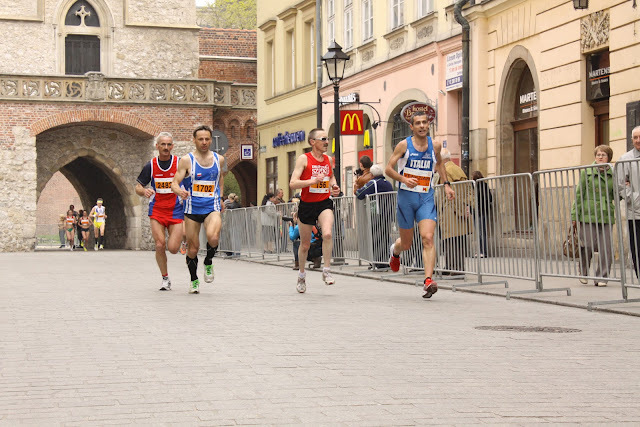 Considering also the modest cost for lodging and food and the range of low-cost flights from all over Europe, it is sure a good choice for a Spring marathon. Good race and good sightseeing for a long weekend. I really felt totally sold-out on them... they are the "perfect shoes" for a marathon (at least for a pronator like myself). 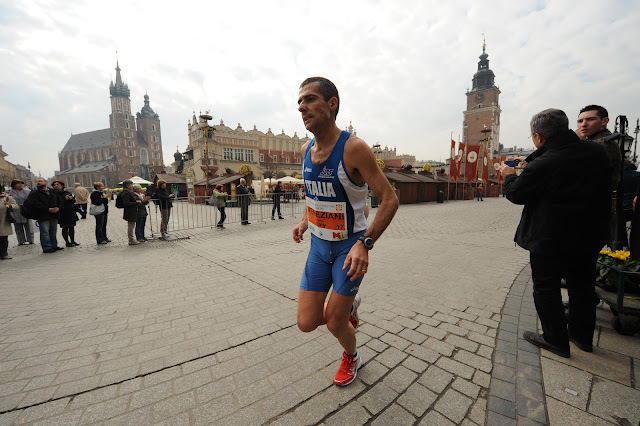 3) Our club uniform: a real hit also in Poland... everybody was shouting "Bravo" and "Vai Italia" !! 4) My overall training plan: no doubts that it works. I think I slacked a bit on the strides, hill sprints, etc and therefore lacked a bit of speed and neuromuscolar coordination. for good inspiration, give a look at the training of Moses Mosop for the Boston Marathon. We are obviously an another planet in terms of speed and overall workload, but the structure of the training plan is clear. 1) Traveling long-haul with small Kids: honestly I think it was it was a "2 minutes loss" factor. - foot: dragged around for 4 weeks with a painful foot, popping pills and putting ice... it would have been better to head straight to the doctor and do the cortisone shot which was a solver in 2 days! - tendon inflammation: also too slow to react... (well the time was not much anyway, but). It come out of nowhere, but I should have headed straight to the doctor. The shot on saturday afternoon did not have enough time to make effect and was too late. I had set-up the screen to disply the average total pace and the average pace of the current lap. I was taking splits at each Km marker in order to avoid the usual GPS errors. But still... my watch was maybe giving me an average lap pace of 3'40" and then I was maybe splitting in 3'45" or 3'50"... So I did not really know what to trust and how to adjust the pace. Looking forward to following your continued progress. Great photos, magnificent and race! Well done on completing the marathon. The course looks beautiful and picturisque. I agree with your assessments about flying long distance with young kids and also on injury prevention. That's why I like to do Aussie/Korean marathon since the flight time is < 8 hrs.